Liguria is a mountainous region in northern Italy, but it is best known for its long strip of coastline that makes up the famous Italian Riviera. Stretching from Italy's border with France near Ventimiglia, to Capo Corvo near the border with Tuscany, the Ligurian coast is actually very rocky and mountainous, but split in places with tiny valleys where houses hang on the hillsides over small ports lined with fishing boats. Five of these amazing fishing villages - Corniglia, Manarola, Monterosso al Mare, Riomaggiore and Vernazza - have become popular with tourists and are known collectively as Cinque Terre. Liguria has a number of fascinating historical sights. One example is Albenga, the city of towers, with its preserved medieval historic centre. Other Ligurian towns of historic appeal include Cervo and Bordighera. Ligurian cuisine is typically Mediterranean, and especially known for its seafood. Ligurian olive oil is highly prized, and regional specialties include pesto alla Genovese, focaccia alla Genovese, and farinata. Ligurian scented wines are cherished for their delicacy and high quality. 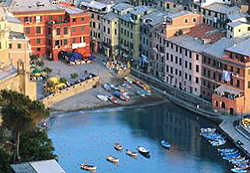 Genoa and Portofino are the major towns of the Italian Riviera. Portofino is still in part a traditional fishing village suffused with prettiness, but since the 1950s it has become more of a resort destination, especially for wealthy yachting enthusiasts. The Portofino harbour has become a docking area for their luxury yachts. Many vacation villas are found in the town, with most of them belonging to English expats. Genoa, the regional capital of Liguria, is famed for being Christopher Columbus's birthplace. It is an important port as well as a historic city. The symbol of Genoa is Lanterna, an ancient lighthouse standing upon the cape of San Benigno. Originally constructed around 1128 AD, the lighthouse is a reminder of Genoa's long history as a vital mercantile and seafaring town, with a status that once earned it the name "La Superba." Genoa's Centro Storico (Old Town District) is the biggest historic centre found in Europe. Most of it is a convoluted maze of criss-crossing little cobbled streets and alleyways known as Caruggi. Along the Via Garibaldi, you will find many lovely Baroque palazzi dating from the 16th century. The main square, Piazza De Ferrari, is marked by a gorgeous circular fountain and adjoined by the Palace of the Doges and the neoclassical Theatre Carlo Felice opera house. Genoa is home to the biggest aquarium in Europe. The impressive Genoa Aquarium exhibits a large variety of sea life including dolphins, sharks, and seals. Beside the Aquarium is Porto Antico (The Old Harbor), a lively seaside promenade lined with wine-cellars, cafes, and other attractions. On the eastern side of the Corso Italia way, you'll come across Boccadasse, a pretty traditional village of old fishermen's houses. Castelletto is a charming residential neighbourhood perched high on the hillside overlooking the Genoese city centre. It is so lofty that you need to take two lifts to reach it. From Castelletto, you'll have a fantastic aerial view of Genoa as well as the Mediterranean Sea.